Social media has become an integral part of business; it provides the opportunity to build and nurture relationships with existing and potential customers, engage with fans and help to build a positive brand image. Employees on social media add another dimension to these benefits. With employees having nearly 10x more followers than corporate social account, empowering them to share and engage with relevant content is an effective way to extend the reach of brand messaging as well as creating influential, internal thought leaders. Implementing a Social Media Policy is essential not only for training employees how to use social media in a professional capacity, but also to protect your company and brand from potential risks to reputation. 'Social Media Do's And Don'ts' Quick Reference Guide - Customisable word document that can be printed and used as a reminder of the key points of the social media policy. Social Media Policy Onboarding Presentation - Whether it's used as top-up training or introducing social media to employees for the first time, this presentation covers the finer details of using social media in business. 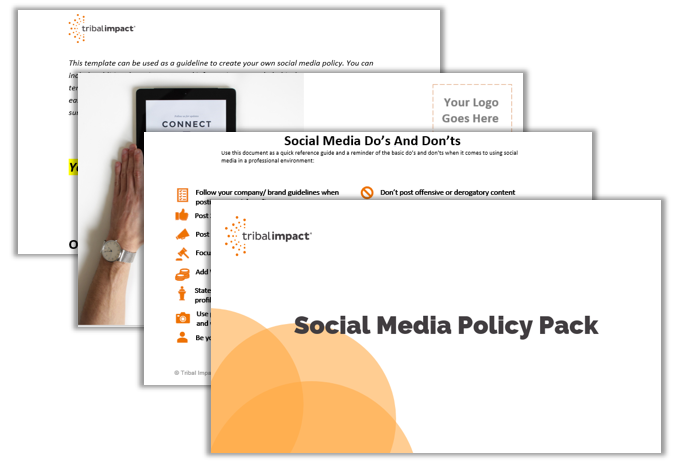 Social Media Policy Template - Take the hassle out of creating a social media policy by using our customisable template. It explains to employees why social media is so beneficial to you brand, the potential risks involved, general guidelines for use and links back to the other documents in the pack by delving into the do's and don'ts of using social media.